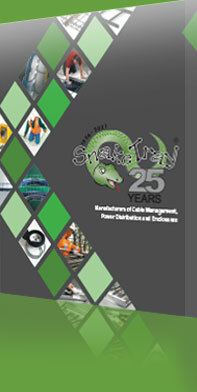 Snake Tray has been innovating cable management and power distribution solutions since 1996! Our goal is to provide our customers with cost effective solutions that help reduce the total cost of construction. Snake Tray, Mega Snake and Snake Canyon cable management do not require field fabrication for transitions and are designed with built-in mounting systems. With a unique stackable nesting feature, they allow for easy onsite material handling and lower shipping costs. We have added aluminum and steel cable trays to our product line to be a one-stop-shop for our customers. Our in-house powder coating facility is ready to paint any color finish desired to complete your project. Did you know that Snake Tray is a leader in power distribution and enclosures? The Snake Bus and Snake Connect power distribution system eliminates the need to hard wire equipment and is completely removable, reusable and green. We also design and manufacture a series of data and power enclosures called Snake Box for workstations, call centers and data centers. Snake Tray Custom Solutions services offer engineers the opportunity to have custom solutions designed and built in our factory to solve any challenge in cable management, power distribution and enclosures. Snake Tray products are stocked throughout the USA to guarantee no delays to our customers. Our 24-hour technical support gives our customers the opportunity to speak with us at anytime to discuss their projects needs. And we welcome the opportunity to help design innovative solutions to make the project install faster. In fact, we are known to design a solution for a customer and have the product built within a day. We are proud to be a USA manufacturer located in Bay Shore, New York. Our state of the art factory stands ready to handle any size job. We are the first in our industry to embrace renewable energy resources by powering our factory with our very own rooftop solar array. Snake Tray is extremely proud to be part of so many great projects. We feel privileged to work every day with engineers, architects, contractors, distributors and end users in a vast array of industries in the USA and throughout the world. We look forward to continuing to serve our customers with products and solutions that offer cost effective and time saving benefits. Thank you for the business. We look forward to working with you on your next project!